I’m not one for making New Year’s Resolutions, but if I had to have one it would be the sentiment in this Mary Oliver poem which I read on the Poetry Chaikhana blog: to remember to instruct myself “over and over” “in joy and acclamation” “of the ordinary,” so I can be left like ” a needle in a haystack of light.” It is a choice, a promise I must make to myself again–and again. It doesn’t always come automatically. As I’ve mentioned in other posts, like A Slice From Whole, I believe metaphor is the nature of reality. The equivalence made between two seemingly different things underscores the unity of creation. Physics now knows this by admitting that at the tiniest level all of matter/light/energy is both a wave and particle. How can this be? I don’t know, but I know that seeing one thing as another is often the key to transformation and creative growth. There is a state of neurological overwhelm those with MS reading this may know well. It is the state of being I call “shattered glass.” It’s my metaphorical name for when the ability to hold and reflect back all the stimulation coming at me loses its cohesiveness and strength, and I can’t “see through” anymore. At these times, I have to rest, shut myself down, and wait for my nerves to reboot a new windshield, so to speak. But these opening lines from Mary Oliver’s poem gave me a viable transformation for living that image. Today, as I walked through the cold gray air of late morning with Romeo, grateful for the receding ice that has made walking outside like pickng my through a mine field for the past week, I felt how the state of shattered glass can become being left “like a needle in a haystack of light.” Those sharp edges can become shards of light that uphold me and not just shards of glass that hold me back. My life holds both, and I can choose. I can choose. One of the things that’s helped my own education in light along in tremendous leaps and bounds is the generosity of my readers over the past 14 months of my life as a blogger. For instance, I learned of the Poetry Chaikhana web site from one of you. I learned that a Chaikhana is a kind Asian tea house, which sprang up centuries ago along the Silk Road, long before hotels were invented. It was a place for travelers and pilgrims to stop and have tea and a meal, as nourishment for their continued journeys, both spiritual and physical. This blog itself has become that kind of a “stop” for me, a place where the gift of reading and writing travels in both directions. Thank you, my wonderful readers, for being pilgrims with me on my journey, and on yours. May your year bring you as many moments of being left with feeling “like a needle in a haystack of light” as your hearts can hold. PS: And don’t forget to make one of Susan’s wonderful black-eyed pea recipes on New Year’s Day to promote good luck throughout the year! It’s hard to pick, but one of my favorites is Black-Eyed Pea Masala. Maria, I love metaphors myself… and imagery, I can get so lost in my own thoughts at times, it is a welcome respite now and then to life and its stresses!! At church with my 3 adult sons, ( what a joy that was for me to say) the lady right next to me, lost her balance 2 x, as she was sitting or getting up. Her older mother was near by, and both of us turned to her and said are you alright? The the next time, she then told me I am ok, I lose my balance, I have MS… I wanted to much to tell her about your blogg and the way of eating all WFPB and on oils. Perhaps next time I see her in church I am can bring it up. I do have one friend in my DAR chapter that has had MS for over 23 yrs now. and I would dearly love to tell her a bit about this WOE too, but I think she knows, and has decided not to try it. 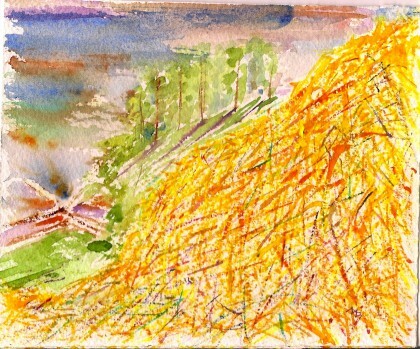 So shine on, in that haystack, it is helping others too. Thanks, Carolynne, for this wonderful reply, and for sharing this story with me. I am so glad the intrinsic significance of metaphor resonates with you, too. What I like so much about this one is that it makes it okay to just be that tiny needle reflecting a fraction of the haystack’s light. Even an infinitesimal tiny shine is just right. 🙂 A very Happy New Year to you and yours! I can relate to the image of shattered glass for when the MS fatigue hits, and I like how you describe your rest as a reboot and getting a new windshield. Thanks for letting me know you can relate to this, Pam, and that you like my describing rest as a reboot and getting a new windshield. So many people with MS resist the need to rest, wishing they didn’t have to, but it is truly restorative, isn’t it? And very Happy New Year back to you, Pam!! Also, I love the different textures in the haystack painting! Happy new year, Maria! I’m so very glad I found your blog, and in doing so, found a new friend. This post helps me remember that I need to rest more – I can’t just ignore it, lest I fail to reboot my windshield. I can choose, too – often I forget. Thanks for the reminder, and the lovely post (and painting!) to start the new year.